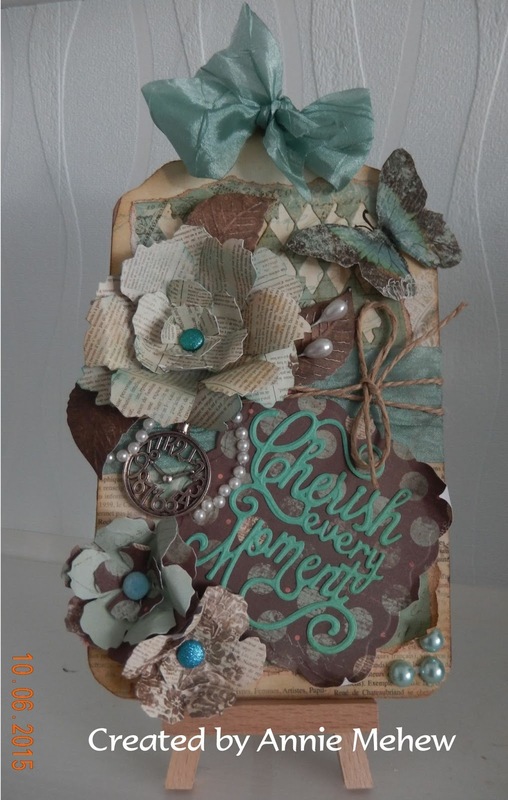 After so many failed attempts I settled on one of my favourite colour schemes Teal and Brown, the papers I used are all by Bo Bunny so I knew they would co-ordinate and then everything else sort of fell into place. I also decided to use some new dies I had bought recently ... Sissix alteration dies 4 different thinlits to give a distressed detail, I used the distressed diamonds effect on the second layer. The sentiment was cut using an only words Diesire die and the flower was cut with my faithful old Tattered Florals Bigz die. Rooting around in my stash I found just the right colour crinkled ribbon, some twine, string of pearls and a watch charm. A very simple project in the end and I was quite pleased with it. Well it's a beautiful afternoon and I did promise to go and help in the garden about an hour ago but got a bit distracted. I am sure a cup of tea for Hubby and a dog biscuit for my faithful friend Jasper will make sure I am forgiven. Wow Annie...this beautiful tag is simply full of fabulous details!! It sure looks like you're an old pro with the distressing!! Have a great day Annie! Annie, I LOVE tags and yours is fabulous...wow..all those glorious details...beautiful! !